If you have done any interviewing, you have created your own particular style of interacting with candidates. This style will either find you consistently great talent, or maybe you win some and lose some. It’s the losing part that is costly with time and money. There is no one way to interview candidates, so let me provide you with some styles that could potentially be effective. Situational and Problem-Solving interviewing is to have the candidate describe how he or she would solve a problem. Provide them with a scenario that occurs in the position you are looking to fill and observe how they understand the problem, what questions they ask you around this problem, and how they provide potential ways that solve the problem. This isn’t usually the first interview in the hiring process. Rather it’s the final stage to the interviewing process for a few select candidates. You will provide candidates with the topic, supporting information and how long the presentation is to be. Candidates will put together a presentation, on a specific project or product, and this will show you how they analyze the information, come up with solutions and how effective is their communication. Nondirective interviewing, also known as an unstructured interview, is when you ask very broad questions of the candidate and they tell you what they want you to know about them. For example, “Tell me about your work experience?” or “What would you say are your strengths and weaknesses?” The benefit is the candidate does most of the talking and can be less intimidating in the interviewing process. Nondirective interviewing isn’t usually the best style to fully understand the candidate’s experience. They may during the interviewing process share information that is not on your list of questions, and you will want to follow their lead. In this type of interviewing, you have a list of questions that you ask all candidates. Your focus is to insure that all questions are answered and you will come back to your them even after diverging into other areas. This is important to make sure that you have asked the candidate all the questions you have to evaluate whether they are right for the job. You know what is important in this open position as well as the culture of the company, so ensure you have answers to your questions. Another benefit of more structured questions is that you create consistency across the candidate interviews and minimize the potential for any discrimination claims as well. Group interviewing usually includes the major stakeholders in filling the position. Stakeholders would be direct supervisor, team members and departments that interact with this position. A candidate will be asked many different types of question, depending on the interviewer. When time and consistent opinion is required, this is a good form of interviewing. I wouldn’t recommend this as your normal interviewing style, unless your culture or company demands employees who can handle high levels of stress. This type of interviewing is to see how the candidate will act under pressure. If used, it could be used for sales or customer service type positions. Stress interviewing provides you will an understanding how far a candidate could go before being frustrated and if frustrated, how will they react. On the negative side, you could have a strong candidate that finds this type of interviewing a real turn off, so understand why you would want to use it and how to best use it. Whatever style you use, the best skill you can have in the interviewing process….LISTENING. 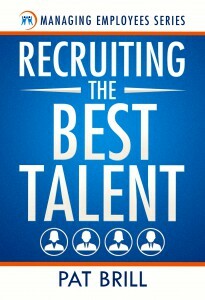 The rule of thumb in recruiting is the candidate does 80% of the talking. You don’t want to be the manager who talks more than the candidate, and if you, you won’t get all of the information you need on the candidate to make your best decision.